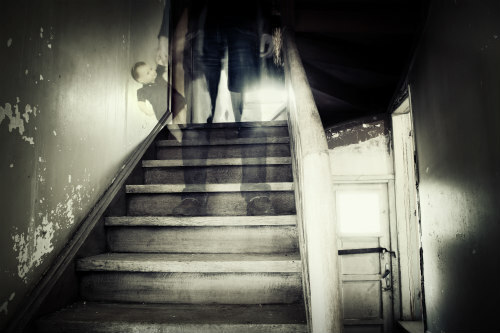 I was raised in a religious family where ghosts were an illusion that could never be real. But that didn’t prevent my mother from telling about several encounters she had throughout the years. The story I remember most was her trying to convince my father not to get mad at my sister in the middle of the night because my sister was frightened by the old man in her bedroom pushing a baby carriage. My mother explained to my dad that she had seen the elderly gentleman too. In relaying the story to a woman who had lived next door for decades, the neighbor told my mother that the grandfather who used to live in our house had died while out pushing a baby buggy. As I got older I understood how little we know about the spiritual realm that surrounds us every day. On her deathbed, my mother wanted to make sure I wouldn’t be frightened if she tried to come back to make contact with me after she passed. Rather than being eerie, there was a comfort in considering the possibility. Then one day I saw The Age of Adaline. I was enthralled with the possibilities of what we don’t understand in our day to day world. My thoughts kept going to what would happen if a young woman lived alone in a house with a ghost? Would it make her nuts? Would it make her sane? Those were the seeds of Maisy’s Mirror. Living with a ghost ended up making Maisy whole and healed and ready to face the world again. I let go of preconceived notions and drafted a story that is completely plausible . . . if you believe in the possibility of ghosts. How about you? Have you ever seen a ghost? Do you believe they could be real? Do you think people are crazy who say they’ve seen one? Let me know in the comment section if you’ve ever had an encounter of a spectral kind. Many years ago, in a long owned family home where bodies were laid out in the farmhouse parlor, my mother found herself late at night alone downstairs. My Dad was away and us kids were sleeping upstairs. My mom got an uneasy feeling when the rocker began moving slightly on its own and decided to go to bed. As she went upstairs with our Great Dane, the dog slowed and began a low growl. As she approached my older brother’s room the window shade came slowly down (not up as one would expect). My mom, a well read and intelligent woman, was pretty freaked out and ducked into bed. Despite her education, she has remained unconvinced about spiritual beings. That reminds me of a story my grandmother used to tell when we were kids. Her aunt had died and they used to have the bodies in the parlor for three days (no embalming). It was her turn to sit the vigil. While she was in the rocking chair next to the body, her aunt took a deep breath, then was silent again. She was actually alive (which is one of the reasons they sat with the bodies). But I don’t think if the rocker was rocking I would walk away. I think I would want to stick around and see what happens. Thanks for sharing!